Kharaillah Tulfah, Saddam Hussein's uncle and future father in law, along with Gen. Rashid Ali and the so-called "golden square" cabal of pro-Nazi officers, participated in a failed coup against the pro-British government of Iraq in 1941. Operating behind the scenes in Baghdad at the time, and arranging for Nazi weapons and assistance was the notorious pro-Nazi Haj Amin al-Husseini the Grand Mufti of Jerusalem. The Mufti had been on the Nazi payroll, according to testimony at the Nuremberg and Eichmann trials, since 1937 when he had met with Adolf Eichmann during Eichmann's brief visit to Palestine. Saddam Hussein was born in 1937. The Mufti, after instigating a pogrom against Jews in Palestine in 1920, the first such pogrom against Jews in the Arab world in hundreds of years, went on to inspire the development of pro-Nazi parties throughout the Arab world including Young Egypt, led by Gamal Abdul Nasser, and the Social Nationalist Party of Syria led by Anton Sa'ada. After the failure of the 1941 pro-Nazi coup in Iraq, the Mufti fled to Berlin where he spent the war years heading a Nazi-Muslim government in exile and using confiscated Jewish funds in a largely successful effort to further pro-Nazi and anti-Semitic propaganda in the Arab world. While in Berlin, the Mufti also helped form pro-Nazi Muslim Hanschar brigades in Nazi-occupied Yugoslavia. Kharaillah Tulfah, participant in the 1941 pro-Nazi coup and an advocate of a pan-Islamic Nazi alliance along with the Mufti, raised and educated his nephew Saddam Hussein from age 10. In 1959, the 22-year-old Saddam failed in an attempt to assassinate Iraqi leader Abdel Karim Qassim. He subsequently fled to Egypt where he received refuge from fellow Mufti disciple Nasser. At the time, Nasser, along with the Mufti himself, who resided in Cairo after the war and his conviction by the Nuremberg Tribunal of war crimes, was spearheading what was known as the Odessa Network, which facilitated the settlement of thousands of Nazi criminals in Egypt and elsewhere in the Arab world. In 1962, Saddam married Sajidah Tuffah, the daughter of his uncle and mentor. Saddam triumphantly returned to Baghdad in 1963 after a successful coup by the Ba'ath Party against Qassim where he assumed control of State Security. The Ba'ath seizure of power in Iraq was followed by firing squads and murder of political opponents reminiscent of Castro's seizure of Cuba. Saddam was chief interrogator and torturer at the infamous Palace of the End set up as a torture chamber under the auspices of State Security. 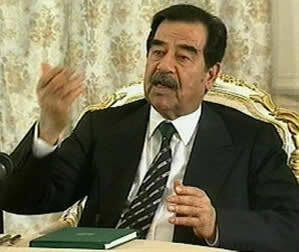 Saddam became absolute ruler in 1979 after assassinating over 20 leaders of his own party. He immediately proceeded to implement the Nazi vision of his uncle and the Mufti. In Iraq, Saddam annihilated of his opponents and, using his absolute power, developed a personality-cult around himself reminiscent of the Nazi Furherprincip. Like the Nazis, who sought to implement a new social order based on socialist and nationalist principles, Saddam has sought to develop a united Arab order under his personal control. Imitating the example of Hitler, Saddam set up concentration camps and began to carry out a planned program of genocide against the Kurds. Saddam, in control of weapons of mass destruction, is today's chief disciple of the infamous Grand Mufti, the Nazi war criminal. Like the Mufti, he will stop at nothing in his quest to annihilate the Jews and defeat the western democracies. His regime is the Nazi principle manifested today in all its horror and inherent evil and like the Nazi's before him, he must be utterly crushed if there is to be any peace.